The AIA Continental Europe Conference in Budapest was an intense immersion into the culture and history of this amazing city. The conference was curated by Nora Demeter, AIA, with an amazing team of collaborators, and created a weekend full of delight. The opening reception on Thursday evening was held at the Hungarian Association of Architects, where we were warmly welcomed. We were given a welcome pack in a bespoke tote made from recycled scaffolding scrim, designed in collaboration with local artisans. The reception was followed by a guided tour through the Ruin Pub District located in the Jewish Quarter. Having fallen into disrepair after World War II, the Quarter is now home to many bars and restaurants and has a vibrant and buzzing atmosphere. The immediate in-depth tour of this unusual area was a great way to start the conference. The opening day of the conference was held at MUPA Budapest: Palace for the Arts. The building was designed by Zoboki, Demeter and Partners. 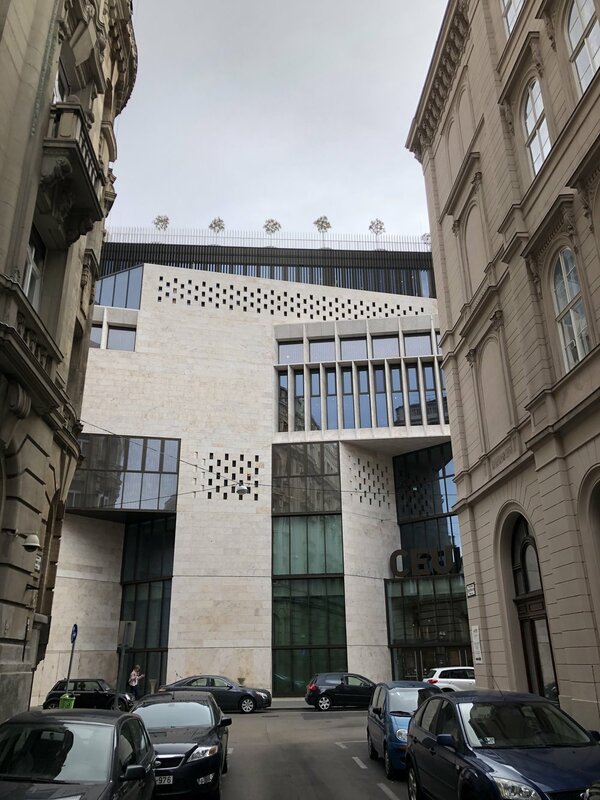 It is “a home for classical, contemporary, popular and world music, not to mention jazz and opera, as well as contemporary circus, dance, literature and film.” We learned about the history of Hungary and its key 20th Century Buildings and were given a tour of the building. Conference participants then had a choice either to tour a winery or to return later to MUPA in the evening for a classical music concert or a circus! Saturday, we started the day at CEU-Central European University designed by O’Donnell + Tuomey Architects (ODT). We heard talks on two cultural buildings that will be located in the city park, both parts of a National project called Liget Budapest; the Ethnographic Museum Project by Napur Architects and the National Gallery Project by Priztker-prize winning architects SANAA. We then heard from Mark Grehan of ODT and the local Project Architect from Teampannon on the creation and construction of Phase 1 of the CEU, followed by a group tour of the building. After lunch we were treated to a tour of the city that highlighted several art nouveau building treasures. The Gala dinner on Saturday night was held at the National Gallery in the Castle District with an exhibition of Frida Kahlo for guests to enjoy. Surrounded by art, each course of the meal was inspired by a different piece of art. The final day was hosted at the Budapest Music Centre. Daniel Taraczky from Art1st Design Studio, lead designer and architect of the Centre, presented its history, concept and design. A lively round table discussion, “Future of Architecture, Culture....” was followed by a building tour before our final lunch together at the conference close. A short video of the conference created by photographer Cordelia Alegra Pradilla can be viewed here. The next AIA Continental Europe Conference will be in Copenhagen 11-14 April. Event details can be found here.